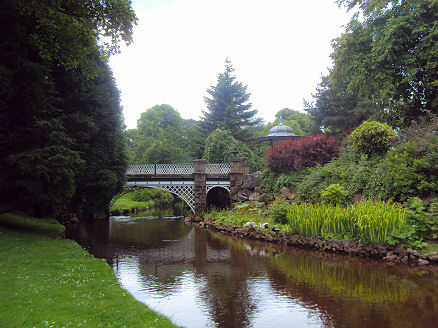 The elegant Derbyshire spa town of Buxton lies near to the Cheshire border in the Peak District National Park. The settlement was developed by the Romans, to whom it was known as Aquae Arnemetiae, meaning the spa of the goddess of the grove. Roman coins found near the Roman baths reveal that the Romans were in Buxton throughout their occupation of Britain. The town was developed by the Dukes of Devonshire in the late eighteenth century, when the 5th Duke used the profits from his copper mines to develop the town as a spa in the style of Bath. The name Buxton is reported to derive from a combination of 'Buck' and 'Stan' (stones), although it has been suggested that its origin may have been Bug-Stan (rocking stones).The first documentary mention of the name Buxton occurs in around 1100 when Bucstones or Buckestones is first recorded on a foundation charter for land given by William Peveril to found Lenton Abbey in Nottinghamshire. Mary Queen of Scots is said to have visited the town several times, to 'take the waters', which were supposed to have healing qualities, during her long English captivity, whilst a prisoner under the custodianship of the Earl of Shrewsbury. 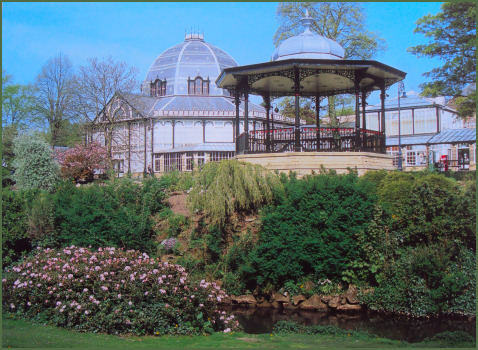 The natural mineral water of Buxton emerges from a group of springs at a constant temperature of 82 degrees fahrenheit. The waters of the spring are piped to St Ann's Well, opposite the Crescent near the town centre. A shrine to St. Anne has existed on the site since the medieval era. Each summer the wells are decorated according to the local tradition of well dressing. The Crescent, (pictured above) one of the finest Georgian buildings in the country, was built 1780–1784 for the 5th Duke of Devonshire and was modelled on Bath's Royal Crescent by the York architect John Carr. The Crescent incorporated a ballroom and an grand Assembly Room as well as a town house for the Duke and shops along the ground floor. The Duke commissioned John White to design The Square (1806 – 07) and St John’s church (1811). Joseph Paxton, one time gardener to the Chatsworth estate, planned much of Buxton including the Gardens and Circular Park Road Estate, the Railway Station and what is now the Country Park. 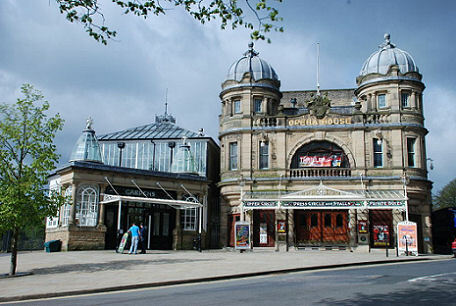 Buxton Opera House (pictured below left) dates to 1903 and was designed by Frank Matcham. An exquisite building with beautiful decoration and superb acoustics, it bears the distinction of being the highest opera house in England. 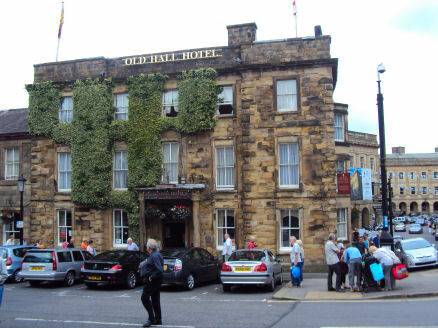 The Old Hall Hotel is one of the oldest buildings in Buxton, it was built to house Mary Queen of Scots during her visits to the town between 1573 and 1584. The present building dates from the Restoration period, built around and incorporating an earlier fortified tower. The oldest part of the building was once part of a four-storey fortified tower, built in 1573 by Bess of Hardwick and her third husband, George Talbot, 6th Earl of Shrewsbury. It is claimed that it was the Queen of Scots who inscribed the following couplet to Buxton on a window pane;- ' Buxton, whose warm waters have made thy name famous, perchance I shall visit thee no more – Farewell.' The original window has now disappeared but a copy of the writing was made and installed in the hotel. Opposite The Crescent stands the Pump Room, next to St Ann's Well. The Pump Room was built in the late nineteenth Century as a place where people could come to take the unique thermal mineral water. It ceased use as a Pump Room in the mid 1970s and became a Micrarium where microscopic organisms and geological specimens could be studied by the public. This was the world's first Micrarium but closed in 1995. 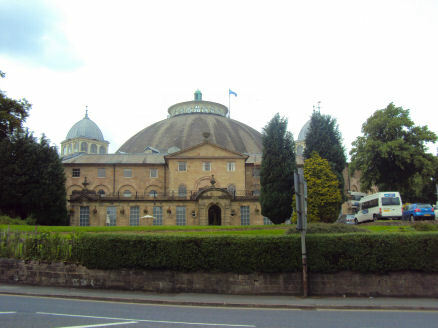 The Devonshire Dome, built 1780–1789, is one of the Grandest eighteenth Century buildings in the town. It was created from the Great Stables and was converted in 1859 by Henry Currey, architect to the 7th Duke of Devonshire. It became the Devonshire Royal Hospital and is now the Devonshire Campus of the University of Derby. The Natural Baths, were built by Henry Currey and occupy the site of Buxton's original Roman baths. The building was opened in 1854 and re-developed as an arcade in 1987, featuring a barrel vaulted stained glass canopy, the largest stained glass window in Britain, designed by Brian Clarke. The opera house is attached to the Pavilion Gardens, Octagonal Hall (built in 1875) and the smaller Pavilion Arts Centre. The Pavilion Gardens, designed by Edward Milner, were opened in 1871. There feature a hot house with a range of tropical plants, tea rooms with a function room which offers occasional entertainments and a bandstand. Opposite is an original Penfold octagonal post box. Fascinating Buxton Museum and Art Gallery hosts large collections focused mainly on history, geology and archaeology, with a superb collection of Ashford black marble and Blue John ornanments. Enjoy a changing programme of exhibitions of art, craft, local history and photography and step into a Victorian scientist's study. The museum and Art Gallery hosts a variety of exhibitions throughout the year running in 3 galleries. The museum is located at Terrace Road, and opens every day but Mondays. Admission is free. Buxton has an excellent shopping centre, centred around a shopping arcade built over the culverted River Wye, just off Spring Gardens. There is a market every Tuesday and Saturday. The town's information centre is in the former mineral baths, by The Crescent. 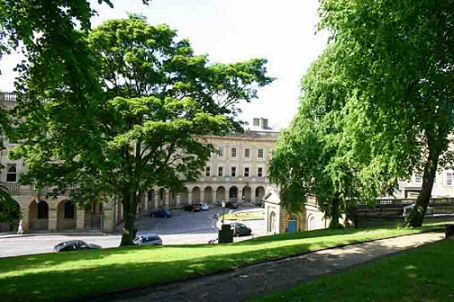 The most famous Georgian building in Buxton is the Grade I listed Crescent, facing the site of St Ann's Well. The elegant building was modelled on the Royal Crescent at Bath, but is smaller, more richly decorated and altogether more complex. 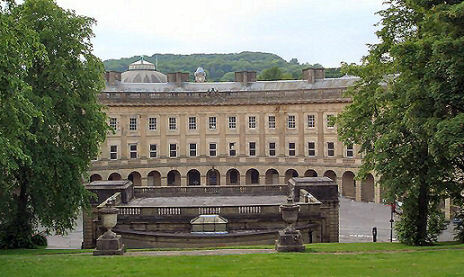 It was built for William Cavendish, 5th Duke of Devonshire between 1780 and 1784 as part of his plan to establish Buxton as a fashionable Georgian spa town and took ten years to build. The architect was by John Carr of York. The facade forms an arc of a circle facing southeast. 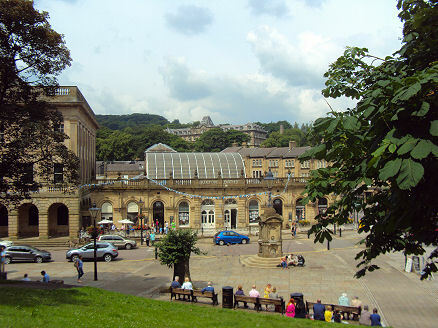 Made of locally quarried gritstone, the Crescent included a ballroom and an Assembly Room with a fine painted ceiling as well as a town house for the Duke and shops along the ground floor, which included a hair and wig-dresser,draper, druggist and perfumer, the kitchens were in the basement. Above it, on the west side, the Duke built a circular set of stables, these were later given to charity (in 1859) by the 6th Duke of Devonshire. Originally detached, the Crescent building is now the centrepiece of an attached range facing The Slopes. Work to transform the site into a £35 million luxury hotel, spa and visitor centre commenced in June 2012. Pooles Cavern is a great carboniferous limestone cavern and one of the finest show caves in England. Evidence of pre historic life from the Neolithic and early Bronze ages have been found in the cavern. Today, Poole's Cavern has a modern visitor's centre, restaurant and children's play area, set at the foot of the country park and Grin Low. At the top of the hill is Solomon's Temple, a folly from which offers excellent views of Buxton and the surrounding hills. Adlington Hall, set in the heart of the Cheshire countryside, the current building was begun in 1315, although late medieval and Tudor remodeling have since changed its appearance.